DAVID CALLAHAN is founder and editor of Inside Philanthropy. He has written extensively on trends in philanthropy, as well as American culture, public policy and business. 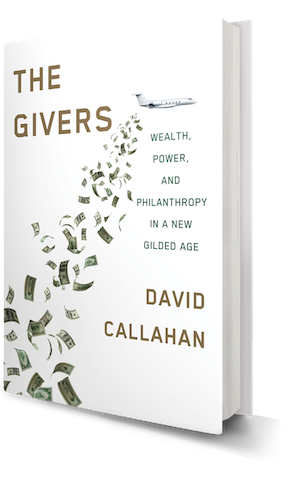 David is author, most recently, of The Givers: Wealth, Power, and Philanthropy in a New Gilded Age. Before launching Inside Philanthropy in 2014, David co-founded Demos, the national think tank, where he held various leadership positions and conducted research on a wide range of issues related to economic and political inequality, as well as writing on moral values, professional ethics and business. Previously, David was a resident scholar at the Century Foundation and managing editor of the American Prospect, the public policy journal. In addition to The Givers, David is the author of seven widely reviewed books on domestic and international issues, including The Cheating Culture: Why More Americans Are Doing Wrong to Get Ahead. He has appeared on hundreds of television and radio programs, including major networks and national NPR shows. He has published numerous op-ed and feature articles, including in the New York Times and Washington Post. He has spoken at over 150 universities and associations around the U.S., frequently as a keynote speaker. David is a graduate of Hampshire College and received his Ph.D. from Princeton University, where he studied American politics and international relations. David lives in Santa Monica, California. You can contact him at davidc@insidephilanthropy.com. Laura and John Arnold are well known for their foundation’s prolific grantmaking. But the couple has long been engaged in political giving, too. And now they’re bringing these two strategies together in a single organization, Arnold Ventures. Before he died last fall, the billionaire Paul Allen built up a powerful in-house capacity at his company, Vulcan Inc., to tackle urgent issues like wildlife protection and climate change. IP editor David Callahan takes an inside look at its unique strategy for impact. Rob Reich has become one of the nation’s preeminent scholars of philanthropy by asking hard questions about the role of private giving in democracies. In an important new book, Reich deepen this critique. But just where, exactly, do his ideas lead? There's a lot going on in philanthropy right now. And last January, we made nearly 40 predictions about what might happen in the world of giving in 2018. We take a spin through the list and see how we did. For all the talk of a golden age of philanthropy, the rich are piling up new wealth much faster than they’re giving it away. Most give mere crumbs compared to their net worth. The Bridgespan Group is looking to change that. A who’s who of billionaire philanthropists spent millions to elect a champion of charter schools to a key office in California. Such giving is a key strength of the charter movement. But is this any way to make K-12 policy? Donald Trump may be a billionaire, but no recent president has inspired fiercer opposition within the far upper class. Many top philanthropists are among those who’ve given record sums in the most expensive mid-term election in U.S. history. Paul Allen, who died recently, exemplified the best of big philanthropy. He embraced risk taking and cared deeply, journeying to the outer frontiers of scientific knowledge and to the front lines of the world’s biggest challenges. IP editor David Callahan assesses his legacy. There are many reasons the right is ascendant and conservatives now dominate the Supreme Court. But one part of the story is the abject failure of mainstream foundations to fight back against a decades-long attack on everything they cherish. News last fall of a hidden $8 billion foundation based offshore in Bermuda underscores just how opaque the world of big philanthropy really is. In a post first published in November, we explore what other surprises might be coming. As Jeff and MacKenzie Bezos turn to large-scale giving, they’re targeting two urgent but neglected areas. That’s smart. But if Jeff is really worried about inequality, his real power lies in changing how Amazon operates. At one level, Winners Take All is a very satisfying read, skewering today’s elite for its hypocrisies. But it offers an incomplete and distorted look at America’s wealthy class and its role in social change. The field of venture philanthropy first emerged two decades ago, fueled in part by the spirit of the dotcom era. IP Editor David Callahan talks to its leaders about what they’ve achieved and how this movement has evolved. After more than a decade of epic giving, Buffett is much richer than when he started. We check in on one of the most fascinating stories of big philanthropy. As another foundation swings behind impact investing in a big way, there are some good reasons to fret about where things are going. Here are a few questions that still need to be worked out. Improving America’s schools has been something of a Holy Grail for funders—as well as a graveyard for ambitious philanthropic schemes. Lately, this funding field has been changing at warp speed. In recent years, many foundations have put equity front and center in their work. But economic stratification only seems to be getting worse in America. Here's where funders have gone wrong. Top donors are mainly guided by their relationships and instincts as opposed to research or metrics. These are among the findings of a new must-read study about this elite group. The giant bank has become a surprising leader in philanthropy's push for inclusive economic growth. We take a deep dive into the backstory—and what JPMorgan brings to the table that's new. Most magazines of ideas and opinion would cease to exist without philanthropic support. Now, we have a better sense of just how much foundation money has been flowing to these publications in recent years. Even as the international climate has grown ever more tense, most foundations remain uninterested in military and foreign policy. IP Editor David Callahan takes a deep dive into funding trends in this space. Americans are now sitting on $100 trillion in household wealth, with nearly half owned by the top 1 percent. Every year, a tiny bit of this gets diverted to the charitable sector. But the wealthy have growing influence as government declines. The Conrad N. Hilton Foundation is the latest major grantmaker to consolidate its programs in a bid to be more strategic. Its CEO explains that this wasn’t an easy process. Why is streamlining these places so hard? His foundation gave away $700 million last year. But in a post-truth age of tribal politics, is Bloomberg’s pragmatic and data-driven approach to giving a losing strategy? The Silicon Valley Community Foundation may be the most intriguing—and confusing—institution in philanthropy today. It also has a surprising number of critics. IP Editor David Callahan takes a deep dive. What's the future for this national trade group in an era when philanthropoids can turn to so many other—and more relevant—places for networking, learning, and support? As a mega-donor, Peterson—who died yesterday—made all the right moves: staying laser-focused on just a few causes and investing in high-leverage public policy work. But the results were decidedly mixed. Trumpism is anathema to the values of philanthropy's first couple, while the administration's policies are a wrecking ball that threatens their foundation's gains. So why aren't they speaking out more forcefully? A year into Donald Trump's presidency, we take a stock of how this political earthquake has affected the world of philanthropy. Last week, we looked at what foundations are doing wrong in the fight against rising economic stratification. Now, we turn the spotlight on a foundation that's been doing everything right.